I am a new course designer in the West Central Wisconsin/East Central Minnesota area. I am currently working on expanding Somerset DGC form its current 10 hole layout to a full 18. The original course designer and I are designing the course to cater to all ability levels (it may not have a true “Gold Level” layout but it will be close). I currently have a thread discussing the Expansion of the course but would like to make the focus of this thread be on designing harder GREENS, not only for this course, but for all course’s. This topic has been discussed on this site before but I wanted to make a thread that is geared just for GREEN DESIGN. I am a snowboard park designer in the winter and also went to school for visual effects and motion graphics. I like to design both on the computer and with my hands. I think I have an eye for designing things I am passionate about. I will look to my experience with designing freestyle snowboard parks and appealing graphics to assist me in my disc golf course design. I have a true passion for this sport and want to make it better any way I can. They are too easy. What I mean is there are very few greens that provide risk/reward i.e. rollaway/fast greens, elevated/lowered pin placement, obstacles inside the circle, water in play and or other things that will challenge higher level players. In my opinion this needs to change and I will be focusing on this in all of my current and future course designs. I have the opportunity to actually make some greens for Somerset through landscaping i.e moving earth, cutting down/planting trees, elevated/recessed greens, adding hazards such as walls or sand traps and anything else I can come up with. The questions for you are…. What do you like to see in a challenging green? Anything else you think will make greens better and more challenging is far game. Last edited by E_Rock25; 11-01-2011 at 04:58 PM. They are too easy. What I mean is there are very few greens that provide risk/reward i.e. rollaway/fast greens, elevated/lowered pin placement, obstacles inside the circle, water in play and or other things that will challenge higher level players. I'm surprised to hear you say this, but I guess I live in a different part of the country. There's one green at my home course that our club is particularly proud of, but there's no photo of it on the website here. I'll have to remedy that and revisit this thread after I've got the photo uploaded. 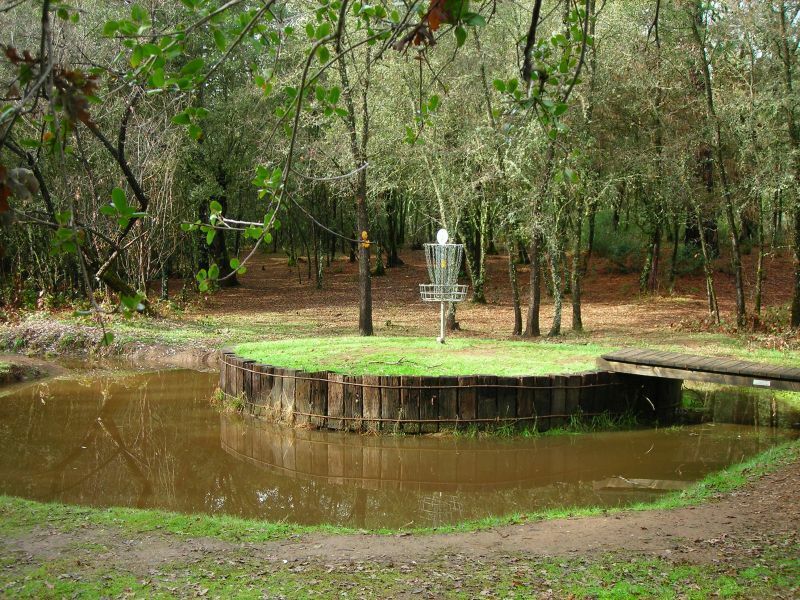 For those who know, it's hole 11, the "Rock Shot" hole, at Oregon Park. When Kevin McCoy, who takes pride in designing intersting greens, designed the current layout, this was one of several holes he decided to preserve in his design. There are some wonderfully creative greens at Flyboy in Whitesburg, GA, that you might look up as well. A simple suggestion is to place your baskets near obstables, on slopes, or near water. Do you really mean to tell us that most of the courses around you have all the greens on flat, open, grassy lawns?? Last edited by Lewis; 11-01-2011 at 05:03 PM. Amazing opportunity you have there Erik...do take advantage. Check out this green from hanging oaks in California. Lots of risk/reward no? There are some greens on most course's that are on slopes or have obstacles near by.... but think about course's you have played as a whole. I bet most of the greens are not that great and could be much better. Putting needs to be much harder in our great sport IMO. I am sick of seeing pros in videos and live miss 30' putts and just drop in for par. I want consequences for missing. Peter that green is exactly what I am talking about. Consequences for missing the putt, or for missing the upshot? If you want to add strokes to players who miss a 30' putt, your best bet is probably seriously sloped greens. 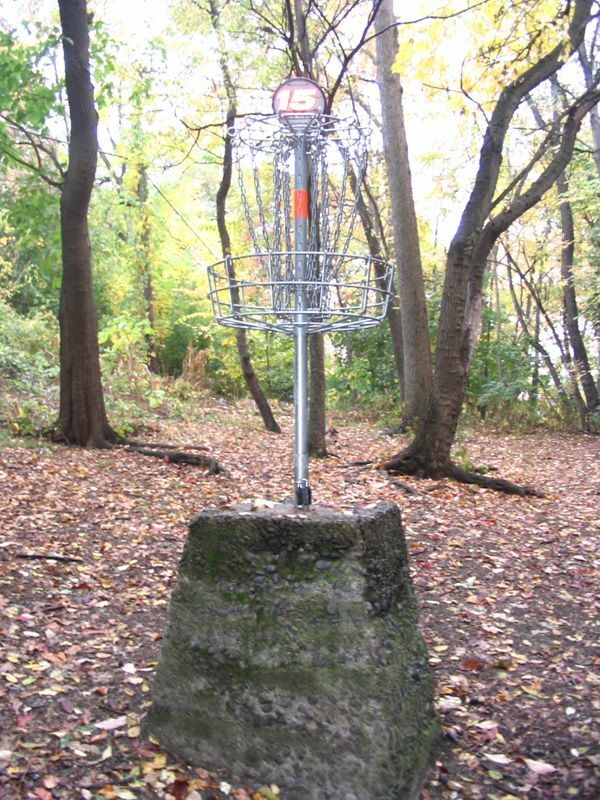 For buckling knees on people's upshots, try water or hiding the baskets behind trees or other obstacles. But don't go crazy: people don't necessarily want a gimmicky putt-putt experience with windmills on the baskets. I know i am not going to put in windmills.... We will have two sets of pin positions on each hole. Each will have two pin placements. We will have one green for advanced level players and one geared for beginners. Each green will have its own basket and one of the positions will be easier than the other. 36 baskets total with 72 possible positions. Hopfully we will be able to have something for everyone from noob to pro. Sounds just like my home course, actually. I'll see if I can take some photos in my free time this week and share them. I think there are some courses in MA like that as well. This one of my favorite pins I play. The ground slopes from right to left in the picture. When on the left (high) side, you can be almost even with the basket. As you walk down the slope your head is about basket level when standing just to the right of the pin. Keep walking down and the basket is almost twice as tall as you are. I agree more unique "greens" need to be utilized.